- Enjoy your Liquor in the most comfortable and stylish 100% Lead-Free Shot Glasses. - These glasses do not contain any harmful chemicals such as BPA, phthalate, PVC, or polycarbonate, so nothing can leach into your beverage from the glass. - Shaped to Be an All-Purpose Glass the base of this glass provides maximum stability. Ideal for all beverages. - The unique glass shape enhances the liquors aromas and flavors. - At almost every special occasion, people choose to share a drink. How would you like having shot glasses that feature a unique design and provide you with incomparable flavor satisfaction? These amazing wine glasses are ideal for all beverages as well. - Spirits inspire much passion that is for certain. Just like national cuisines, there’s more than just professional pride at stake. Sometimes, using the wrong utensils can provoke outrage and ruin a perfectly good meal – literally. For example, bringing a stainless steel spoon to a dish of caviar is a bit like bringing a knife to a gunfight. 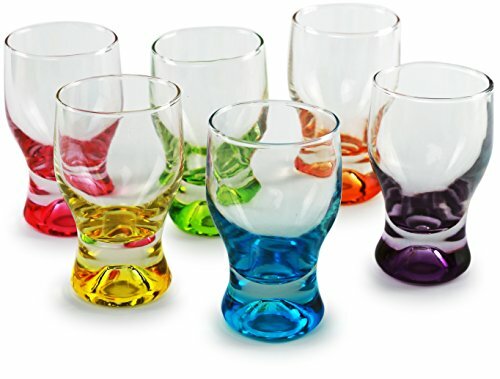 - These shot glasses are made of thicker glass, particularly on the base. This reinforcement is designed to prevent it from shattering when the drinker slams the glass onto the bar after downing the drink. - These glasses are eye-catching. They are innovative in design, style, and form. Ideal for contemporary bars or stylish restaurants. - The sturdy, solid design of these shot glasses makes them reliable and less likely to break, than the traditional shot glasses. - Can be used for informal or formal entertaining. - Take away the anxiety related to holding a traditional shot glass. - The sleek compact design makes them fit better just about anywhere you'd like to place them. - How many times have you accidentally knocked over your conventional glass? Designed with a flat base makes them a pretty stable vessel. The lower centre of gravity is a key factor in avoiding mishaps. - Investing in a good set of shot glasses will not only make your life a little easier in terms of cutting out spillage and breakage risks, but it will save you money on replacement and cleanup costs in the future too! - Glass fixes the problem of keeping the outside out while simultaneously letting you rest at ease knowing that with every sip from your glass, you’re just drinking the beverage and not the cup! - A shot glass can just be any normal container that you pour your favorite alcoholic drink into. But if you want to add a little spice to your drinking experience, it sometimes pays to buy remarkable and cool liquor glasses that you can use during drinking activities. Such a glass adds a completely new dimension to the way you deliver your shots to your waiting palate. - Now you can serve up different fun party liquors to your most important guests. A fine addition to any at-home bar collection, these shot glasses are a fantastic conversation starter. It gives you and your drinking mates a great way to partake of your favorite liquor shots. This can be tequila, whiskey or even fruity cocktail blends. Additionally, they make an unforgettable house warming gifts to cheer up your friend, guest or a business colleague. - Now you can fully enjoy your drinks with your family and friends while impressing them with these stylish and modern shot glasses. Perfect suitable for Kitchen, Cafes, Hotel, Restaurant, Bar and Everyday Home Use.